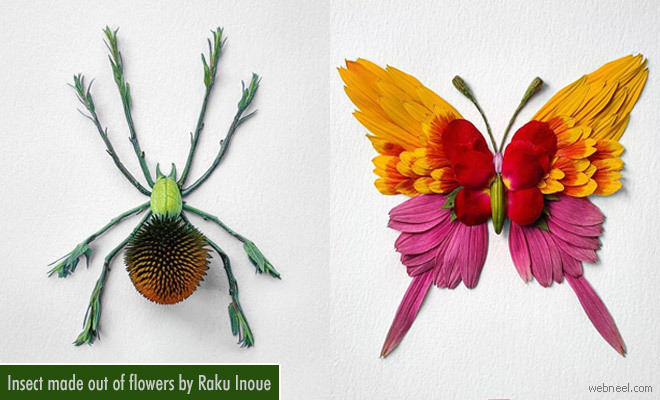 Creative Art : Natura Insects by Raku Inoue is a creative flower art, where in flowers, petals, leaves are arranged in the shape of insects. Raku has a lot of creativity and imagination and you can see that in his creative flower art. We might as well say he has magic on his fingers. The small insects are so neatly arranged and he hasn't forgotten the detailing. It's way too accurate. Some people call insects as creepy things and others adore them as pets, Raku sees them as part of nature. If we don't have bees and butterflies, we will not have honey or flowers. According to his biography, "You may be an artist or a designer, perhaps a musician or a chef. In the end we all share one thing. It is the desire to create, the desire to transform ideas into reality. For us, the fertile creative environment is an indispensable condition. Just like plants, inspiration need the rich soil to grown on. And if we give our attention and care, they grow to bear the real fruit of creation".